These candle holders are great. Remove the center section and replace the stone with a mirror or picture. 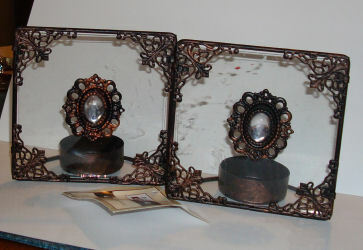 The glass sections could be used as fancy windows of some sort; or remove the glass and use the metal trims in various ways. Even the candle cups can become large pans in a rustic kitchen or wash room. 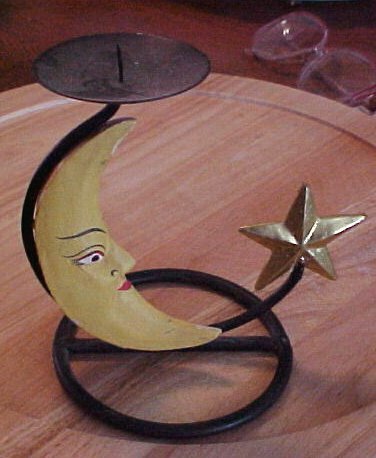 This votive candleholder is just too cute. I may plant a tiny witch's garden or a cemetery in the opening. 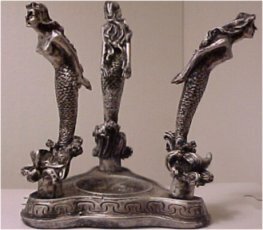 I found this great candleholder at the Goodwill Store for less than a dollar. I am not sure yet exactly how or in what configuration it will be used, but I definitely know where it's going to go - my East of the Sun/West of the Moon Bakery. 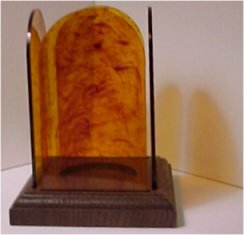 This nice wood stand is designed to hold one of those gigantic candles that probably are only used at Christmas, but when I saw it, I immediately thought it would bring some of my smaller dome settings up to a more comfortable viewing height. I paid $10 for it, which is not as cheap as some of my thrills, but it's something that can be used for various things, including -gasp!- one of those huge candles someday, if I ever find one on sale. 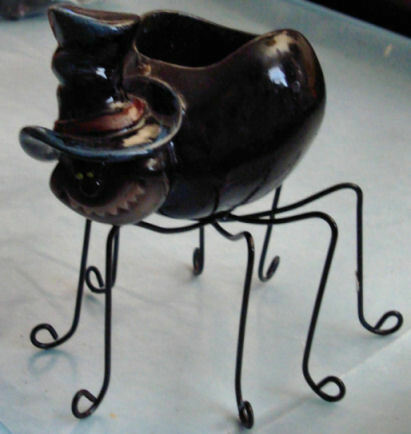 I can just see this low tray, also designed for a large candle, eventually holding one of my Green Men. Love that leaf shape on the feet! Paid $6 for it, but I think it will be worth it someday, if I ever get another Green Man setting ready; perhaps even a dome scene. I found this candleholder at the dollar store. No idea what I will do with it yet, but it was so intriguing. I will probably wind up taking it apart into different elements when I start working with nautical things, of which I have an ever-growing collection. 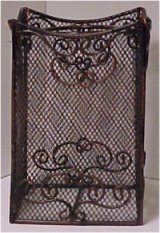 I saw this and immediately saw it as part of a screen door, or the corner of a wrought iron fence, or even a folding screen in an old-fashioned dressing area. I suppose maybe it just slips over a candle?For my purposes, however, it could go either way, depending on what I want it to become. To separate it at the corners will mess up one long metal piece on the side, depending on how it is cut apart, so some kind of new edge will have to be put back on. 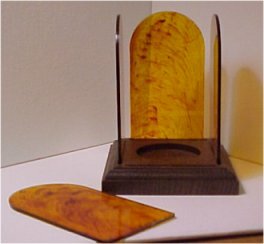 With just the reflection of my photographing lamp you can see how these amber panels reflect light. I can see them as windows in a castle or a church. 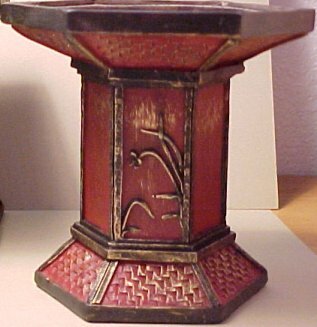 Of course, with the wood base, it could become a three-sided setting, too. And then again, the wood base could be used for something else. By golly, an exact fit! This put a whole new light on things. As is, this one looks quite Oriental. 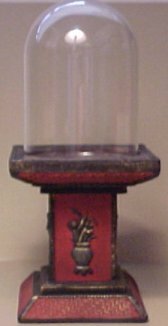 I can just see it with a Japanese garden inside the little glass dome, or perhaps showcasing a small Oriental figure. This one, however, has a slightly different pattern. 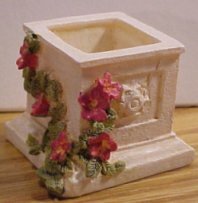 It's just an urn with flowers. 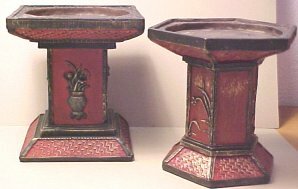 Repainted, it wouldn't necessarily have to suggest Oriental. 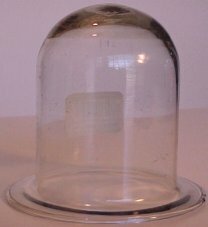 I could use it with the dome, or alone as a base for another kind of quarter scale roombox, with another type of garden, maybe. 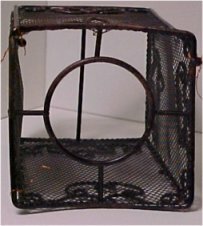 That is a basketweave pattern on the base, which could also suggest something connected with baskets, or wicker chairs, etc. 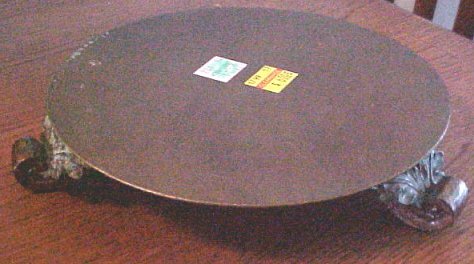 This small dome is the upside-down insert that fit in an iron ring base; don't know what happened to the base; got it for pennies. I think it was intended for potpourri. I also have used the bases when I found them without the glass, too! I used an orphaned base to form part of the top of Anachronon the Wizard's cart. Scroll down to end for info. Otherwise, it could serve as a base for another quarter scale roombox; even a house, I suppose. 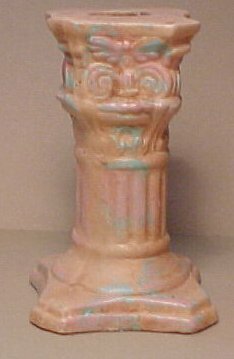 This more slender candleholder is about 3 and 1/4 inches. 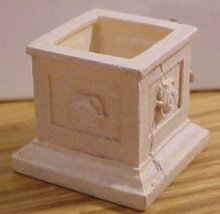 It could become a centerpiece fountain or birdbath in a one-inch scale garden setting, but I can also see it as a base for a quarter scale scene. 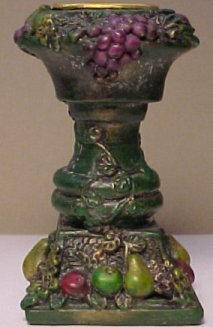 Its fruit motif could suggest anything from Tuscany to Thanksgiving. And, wow, look at those grapes. 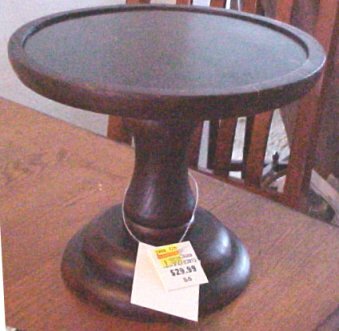 Maybe a quarter scale roombox of a wine-tasting scene, or an Italian restaurant setting could sit atop this base. 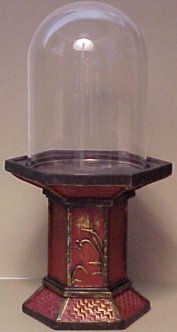 This candleholder would look great in the right garden type environment, either outdoors or in a conservatory. Since it has a rather prominent design, I would use either a topiary or some kind of tree in it, rather than flowers to compete with the flowers already on it. On the other hand, if you wanted to use flowers in it, you could turn it around like this and put the flower side to the back.